Sony's first Ultra HD Blu-ray player has hit the market, in the form of the UBP-X800 first introduced at CES. At $299, the UBP-X800 is priced in the more entry-level category, with the likes of Samsung's UBD-K9500 and Philips' BDP7501. However, it carries some features that pit it against higher-priced units like the $550 OPPO Digital UDP-203--namely, support for SACD and DVD-Audio high-resolution audio discs, which makes the UBP-X800 a true universal disc player. Like all UHD players, the UBP-X800 can pass the higher-quality video signal on a UHD Blu-ray disc, including Rec 2020 color and the HDR10 High Dynamic Range format, but not Dolby Vision HDR. It offers both wired and wireless network connections, as well as built-in Bluetooth with AAC/LDAC support to stream audio to headphones or other Bluetooth audio devices. Netflix, Amazon Video, and VUDU are integrated, as is Miracast screen mirroring technology. The player supports high-resolution audio playback via disc, USB, and DLNA, and it also features Sony's DSEE HX upscaling technology to improve the quality of lower-resolution compressed audio files like MP3. The UBP-X800 feels a lot more substantial than the other sub-$300 players. It's more comparable in build quality to the OPPO UDP-203. It weighs eight pounds and seven ounces, which is roughly twice that of the Samsung player and close to the OPPO's 9.5 pounds. While it does not have the solid brushed-aluminum front faceplate of the OPPO, its steel cabinet sounds a little thicker when you give it a knock with your knuckles. The one build area where it falls short of the OPPO is in the inclusion of a front-panel display. The reflective front panel looks like it might contain a display, but alas it does not. That reflective panel actually drops down to reveal the slide-out disc tray. Small power and eject buttons sit to the right, along with the player's only USB input, covered by a pull-off door. Around back, the UBP-X800 is similar in connectivity to the other sub-$300 players. You get two HDMI outputs: one HDMI 2.0a AV output and one audio-only HDMI 1.4 output. Sony has kindly covered up the audio-only output with a piece of tape, which is a subtle but helpful way of letting people know that they shouldn't use that particular output unless they need to mate the player with an older AV receiver that doesn't support 4K/HDR pass-through. The only other AV connection is a digital audio output, and here Sony has made the odd decision to go with coaxial instead of optical. That's probably not a big deal if you mate the player with an AV receiver, but it could be a concern if you use a soundbar or powered speaker, as many of them only offer optical digital audio inputs. At least Sony has added Bluetooth audio output, so you can connect to many powered speakers using that method. The supplied IR remote includes a direct Bluetooth button that pulls up an onscreen menu for the quick pairing of Bluetooth devices. 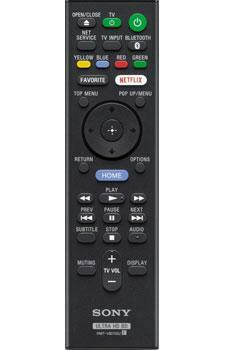 The remote control is small but contains all of the desired buttons in a logical layout. This player lacks some of the advanced connection options you'll find with the more expensive OPPO and Panasonic players, such as multichannel analog audio outputs and an RS-232 control port (it does support IP control, though). The upcoming and higher-end Sony UBP-X1000ES player will include these type of connections. The X800 also lacks the OPPO's HDMI input to pass-through another source, like a streaming media player or cable/satellite set-top box. Initial setup is quick and easy: just select your language, choose to enable or disable the Quick Start mode, agree to Sony's licensing, and set up your wired or wireless network connection. I used the onboard LAN port for a wired connection, but 802.11ac Wi-Fi is also built-in. During my review session, I mated the player directly via HDMI to my reference LG 65EF9500 OLED TV, as well as the Sony XBR-65Z9D UHD TV. I also added an Onkyo TX-RZ900 AV receiver to the mix at times to test audio output, alternating between the main HDMI AV output and the audio-only HDMI output. One important setup note: Many UHD TVs require you to enable UHD Deep Color to pass the full bit depth, color space, and HDR that are possible with an Ultra HD Blu-ray player. You can do this in the TV's Video or Picture setup menu. The LG TV that I use has a setting in the Picture menu called HDMI Ultra HD Deep Color, and you can enable it per input. What's nice about the Sony player is that, during initial setup, it puts up a notice that reminds you to perform this step in your TV and even tells you where to find the setting in Sony's UHD TVs. Of all the UHD players I've tested thus far, the Sony's Home page is my least favorite. It's not horrible; it's just a bit boring and disorganized. It doesn't have the big, colorful icons of the Samsung or the beautiful high-resolution images of the OPPO. The page is divided into two main sections, with "Featured Apps" to the left and "My Apps" to the right. At the bottom right are tiny squares for Disc, USB device, and screen mirroring. Even though this is a disc player, the position of the disc icon makes it feel like a secondary function or afterthought. Up at the top right are options for "All Apps" and "Setup." In the setup menu, most of the UBP-X800's screen settings are set to auto by default, ensuring that the player will work with any TV to which you connect it and automatically pass HDR if the TV supports it. The player includes an Original Resolution (aka source direct) mode, which is rare at this price point. In other respects, though, the Sony player doesn't quite have the setup flexibility of the more expensive OPPO player, although it's better than what the Samsung player offers. Most current UHD movies are mastered at 10-bit BT.2020 color with a YCbCr 4:2:0 color space. With the OPPO player, you can set up a Custom output with those exact specs if you want. With the Sony, you can set the color space to RGB, YCbCr 4:4:4, or YCbCr 4:2:2 (but not 4:2:0) and turn the Deep Color function to allow for 12- or 10-bit output, but you can't set a specific bit depth as you can with the OPPO. That more advanced level of setup probably isn't crucial for most consumers, but the Type A videophile might prefer the OPPO player. On the audio side, the player has internal Dolby TrueHD and DTS-HD Master Audio decoding. It is set by default to mix audio and commentary on Blu-ray discs (called BD Audio Mix), which will downmix Dolby TrueHD and DTS-HD Master audio soundtracks--so you'll want to turn it off in order to pass the higher-resolution soundtracks. Leave the digital audio output set for auto in order to pass Dolby Atmos and DTS:X 3D audio tracks to your receiver for decoding. As I mentioned, this is also a universal disc player, handling both SACD and DVD-Audio playback. It is configured by default to play the multichannel SACD layer; however, DSD output via HDMI is turned off by default. In this configuration, my Onkyo TX-RZ900 received a 176.4-kHz PCM signal over HDMI when playing SACDs. Once I enabled DSD output, the Onkyo receiver used its internal DSD decoding to deliver SACDs at the full 2.8 MHz. As for the built-in streaming services, Netflix is available in Ultra HD with HDR, Amazon Video is only available in Ultra HD (no HDR), and VUDU is the standard, non-UHD version. I had no issues signing in and streaming content from these services.